By J Hutcherson (Sep 25, 2018) US Soccer Players - The day before the US Open Cup concludes, the Dutch Cup begins. The KNVB Beker if we're being specific, it's a tournament that can only salvage a season for a club not in title contention. It's not a substitute trophy, or even much of a consideration for the teams trying to win the league title and do something in Europe. Still, at 101 years old it's something to play for on a Tuesday night. With the preliminaries over, it's time for the first round. Winning the Dutch Cup qualifies a team for the qualifying rounds of the Europa League. That's somewhat important for a league that only has one automatic Champions League spot. As you might expect, that goes to the winner of the Eredivisie who also gets to play the Dutch Cup winner in the Johan Cruyff Shield. Here's an example of how important that season starter is. When I lived here a few years ago, I came across it by accident. The game was at Amsterdam ArenA, but not advertised except for the cities involved. No Ajax that year, so no reason to bother inviting the neutral support to the stadium. I was out for a walk and decided to go to the stores that are part of the outside of the ArenA. There was no way to buy a ticket to the game about to start inside. It wasn't sold out. Dutch pro soccer is weird that way. Attending games normally requires a club card. What was originally intended as a hooligan preventative has become a pain for tourists looking not to get fleeced on tickets. If you've got a club card, they're cheap. If you don't, they're probably not. That club card ties you to one club, technically preventing buying tickets officially for any of the others unless the game is considered so low profile that they open it to anybody with money. AZ's Europa League campaign fell into that low profile category a few seasons ago. Meanwhile, Ajax in the same competition that season required a special European season ticket. Which brings us to the Dutch Cup. It's not high profile enough until the later rounds to warrant anybody getting overly bothered. Round one begins with everybody from the big league involved, normally playing teams most Dutch people have never heard of. For defending Cup winners Feyenoord, they're at VV Gemert in Helmond. Eredivisie title holders PSV is at Excelsior Maassluis, the Excelsior that doesn't play in the topflight. Then there are the second division teams, a tough league to love with a mix of B squads, former and wannabe Eredivisie teams, and a collection of clubs that stretch the concept of professional much less promotable. Telstar, last season home to USMNT player Andrija Novakovich, is somewhere in the middle. They've got a nice enough stadium that's not quite in IJmuiden, a town that isn't on the rail line and requires a "see all the stops" bus ride from Amsterdam's Sloterdijk station. They start their Cup campaign at AFC, the other Dutch soccer club with Amsterdam in their name currently playing in the third level of the pyramid. The Dutch league system dispenses with fully professional after the second division. From a "slap yourself in the face it's so obvious" perspective, AFC raises a lot of questions. They have what's arguably the best stadium location in the Netherlands. It's a short walk from Amsterdam Zuid, now a relatively nondescript station surrounded by high rise buildings. Potentially, Zuid is the future international train stop for Amsterdam with the city reorienting around it and leaving the old center for the tourists. How close this is to reality is a good question, but AFC is just around the corner. Should this new vision for Amsterdam work, AFC is their local team. Any American sports marketer would already be putting together the group to buy AFC, push them into the professional ranks, and get them in the Eredivisie as soon as possible. They'd be turning their plot of land into a mixed-use stadium development and saying not so nice things about Ajax a few miles away. This is not America, and AFC isn't interested in climbing the divisions. They were one of the clubs resistant to the Dutch Federation's plan to force professionalism on teams promotable to the second division. It's not who they are, or how they see themselves. 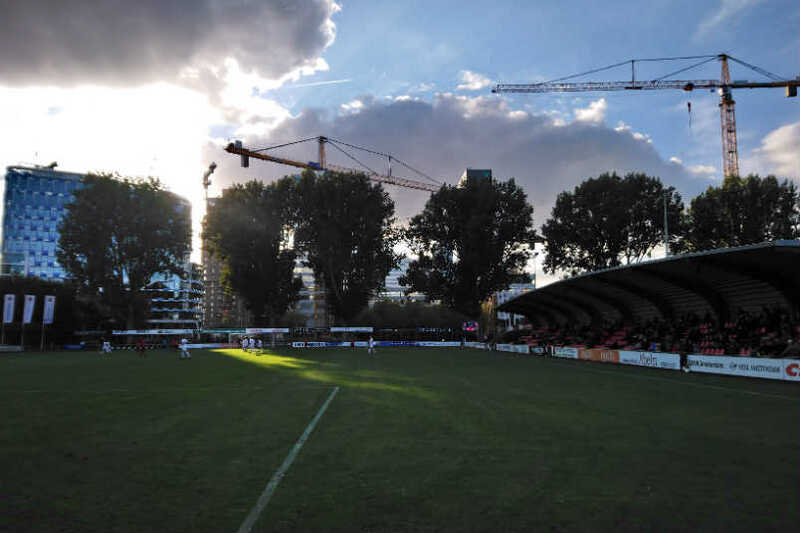 On Tuesday, they hosted Telstar in a game that started promptly at 5pm local time. Why? In English, the name of AFC's stadium translates to "Good Enough" which is true for their regular Saturday daytime schedule. What it doesn't have are lights. Let's go ahead and get this out if the way. AFC's amateurs and half-hopers won 5-0. There was no pitch invasion, no lap of honor, no old eyes filling with tears as they watched the unbelievable play out in front of them. Nobody's laughing Telstar out of their league. That's the peculiar magic of this Cup, a familiar feeling to American fans who want more from a competition that only delivers on its terms.